I’m going to get ventress a pinky as a treat today as I like to make sure he doesn’t get bored, the only problem is... beyond defrosting it I have no idea how to prepare it for him? What do you guys do? I was advised by my reptile vet that pinkie mice should not be offered except as a rare treat (if ever). They are very high fat content. I feed them to my gestating females and after they give birth for added protein and weight gain. Occasional treats otherwise. I breed my own rats (I have many snakes) so they are always available, fresh or frozen. If frozen, I simply thaw them in hot water. I just feed pinkies thawed out on tongs, just like you would for a snake. It's a rare occasional treat. Sometimes it works great with the picky feeders too. Totally agree. Gets them going after birthing and out of brumation also. Kind of like a jump start. I can't see how this can be bad for them. Whole prey items are pure nutrition, and there isn't a heck of a lot of fat on a pinky. The only problem I see with feeding more often, same with insects, is that they seem to refuse everything else after that! Thanks for all the replies everyone, il stick to it bring a once in a blue moon treat for him. Just think the more variety the better so the more things I can offer him over time the better. Just putting this information here for future reference . The Fat content is 17% - 30% & high risk of bacterial contamination (due to poor storage while frozen and then thawed) , so on that basis , I don't give them to my dragons or skinks ,even as treats. I do what works for me, and what has been working for me with 40+ years of reptile keeping experience. I urge others to do the same. I don't use charts and graphs, but my own experience. In all my years I have had one vet visit with a reptile. It was an egg bound bearded dragon. That was in 1997. 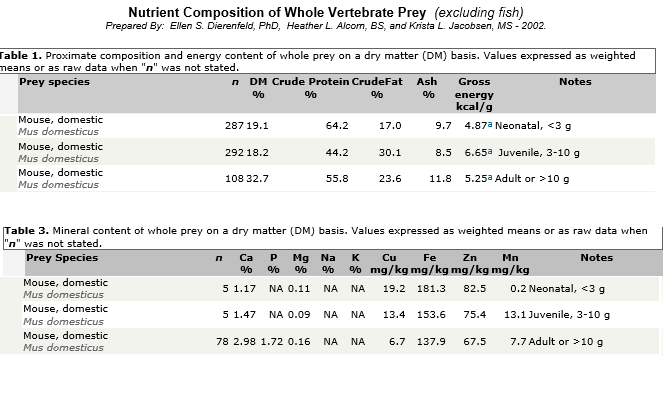 Truth is they are high in fat relative to the rest of a skinks normal diet. If they become a regular part of the diet, expect a drastically shortened lifespan, not that I think anybody here is advocating for that. With that said, nothing wrong with feeding the occasional pinky here and there. Rodents would be a natural part of their diet in the wild, although infrequent. I don't feed pinkies myself but from what I have seen they seem to enjoy them. Mine will not eat anything else but pinkys and insects while gestating. The added protein and natural calcium can do them nothing but good at this time. I was advised by this country's most prolific reptile breeder to feed them (actually rat pups) while gestating and after birthing. Gets them back on track very fast, and my animals are by no means overweight or unhealthy in any way. I do not use rat pups, but ASF rat pinks which are quite small. No matter what kind of concoction I try and get them to eat they'll have nothing of it at this time, and I'm certainly not going to let them go without. I would not use them as a constant, but as an appetite stimulant nothing works better. They soon lose all interest in food when gravid, so you need to get them to eat while you can. If they do not have the weight, the babies will soon use up all of the female's reserve and she will have a hard time. Yeah I totally agree with you on observations. It makes sense to me that a gestating Blue Tongue Skink or one coming out of a brumation may benefit from a pinkie or a rat pup. Unfortunately there's a lot of conflicting information out there regarding the feeding of pinkies. Some argue that the fat content for a pinkie under 3 days old is actually a fairly reasonable amount, but unless you are breeding your own mice, how do you really know? It's been said that a lot of fuzzy mice are being sold at pet stores as pinkies, so that's where the fat content can really go up. You'll also hear the argument that the bones of a pinkie are underdeveloped so there is little calcium benefit, but then I've also heard the exact opposite from others. As for rat pups vs. pinkies, many snake owners prefer to feed rats over mice, citing a higher nutritional content so maybe that's where that came into play. Again I'm not sure as I'm not a biologist or nutritionist, just a guy who keeps skinks, so like you, I tend to stick with what works for me, especially when the information is conflicting. What I do know for sure, is that I've heard a few stories from BTS keepers that fed a diet primarily of mice and the common result was fatty liver disease and early death. And similarly, I've heard from people that feed mice occasionally or as you said during a gestation period, with good results. So I kind of prefer to go off of that. Small size fat content between 24% - 28% fat. Not good. Starting to wish I never started this thread, didn’t realise it was going to cause such controversy! Gonna hang fire and just feed him one if he ever goes off his food... so far not an issue cuz he’s a little greedy guts. Thanks for everyone’s input. Don't be sorry. Different perspectives on issues and civil debate, which i think this has been, is not a bad thing in my eyes. Sometimes it's necessary to hear different points of views to learn. mb606587 wrote: Don't be sorry. Different perspectives on issues and civil debate, which i think this has been, is not a bad thing in my eyes. Sometimes it's necessary to hear different points of views to learn. I see no problems with offering real nutritional data (when it's available) and offering an OPINION. The data is there for others to see and use in making an educated decision.